Hyakkaou Academy is a place to foster the next generation of elite. The students are top calibre, but what matters most isn't academics, sports, or money. It's gambling. Some rise to the top of the hierarchy, while others fall further and further into debt. Ryota has finally reached the bottom, and is now at the status of a "pet". His luck changes for the better with the arrival of an unusual transfer student: Yumeko Jabami. Not only are her gambling skills incredible, she can turn the tables on cheaters as well. Will the student counsel allow her to shake things up, or will her luck run out as she's consumed by the insanity of gambling? My gambling exploits come down to losing $40 in Las Vegas, and playing the casino in Dead Or Alive Extreme Beach Volleyball 3, where I invented the "Iron Cross" in Roulette, allowing me to lose money at about half the rate I normally do. Anime often having a "theme", I wouldn't put gambling at the top of my list for what I'd want it to be about, but I loved the hell out of Kakegurui. What didn't I like about it? Nothing. I even loved the opening AND end credits. While Kakegurui is an anime featuring gambling, what I especially liked was how it captures and focuses on the true essence of gambling. Kakegurui is over the top in many aspects. This is certainly embodied in the art style which is normal, until facial distortions give a more grotesque look, emphasizing what's happening. I thought it was odd at first, but it really grew on me. Why? What makes Kakegurui good are all elements working in concert to heighten intensity. Worth mentioning is the voice performance of Saori Hayami as Yumeko. With her soothing feminine voice, she's often typecast as elegant lady like characters. 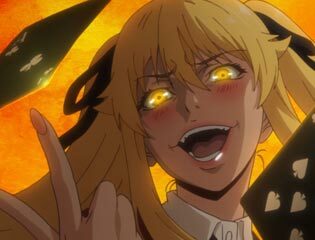 Her performance in Kakegurui showcases how incredibly dynamic her talent is, giving the impression of a polite slightly spacey girl, who goes berserk when enthralled with the thrill of gambling. 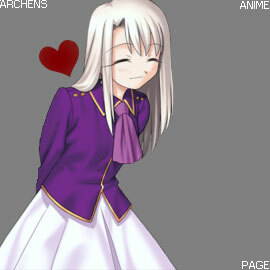 Other voice actors do a great job too, Mary's (Minami Tanaka) voice is bone chilling when she's in sadistic mode. Each of the adversaries has a gambling forte, and a personality which complements it - and all intriguing. A big boon to the show was having a strong main antagonist; the student counsel president. She's elegant, sinister, yet very mysterious as to what motivates her. Unlike many other shows, she's developed in a way which made me very curious about her, instead of shoving it in your face as the show tells you nothing, while reveling in how mysterious the mysteries are. The gambling rules were a little hard for me to follow at first, but generally make sense once they start playing (and it's explained to the viewer). It integrates well with the story, keeping each step of the plot interesting. 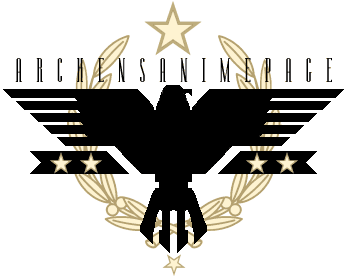 I guess this would be a good time to point out that this anime is very sexualized at times. I'm not sure what to say about that as it feels like an odd fit in some ways, yet also in line with the way the show goes to extremes. What made this anime especially enjoyable for me was capturing the essence of gambling. Yumeko isn't interested in simply winning, because there is no thrill unless there's a risk she'll lose. Higher stakes only makes her want to play more. She doesn't always win either, and is intentionally up to something something in the bigger scheme of things (yet to be revealed). I loved the way players scheme, and especially how they torment each other. 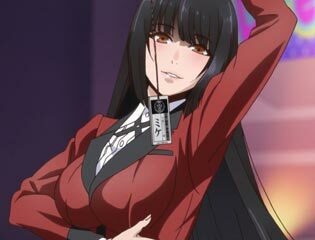 It may seem like yet another anime with a gimmick (gambling), but Kakegurui does an incredible job leveraging the material to be thoroughly entertaining. It may be a little extreme in some aspects which could be a turn off to some, but I couldn't get enough of it.